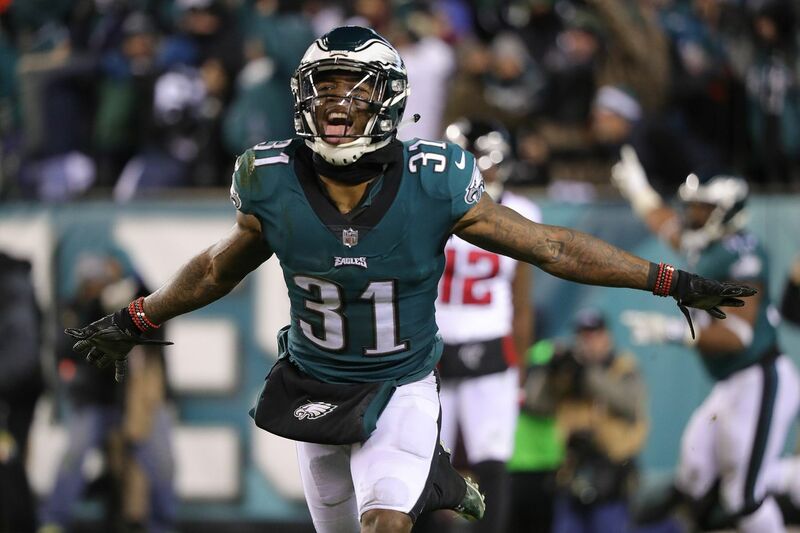 Jalen Mills celebrates after breaking up a pass intended for the Falcons' Julio Jones during the Eagles' win over Atlanta in the playoffs last season. The Eagles kick off the season against the Atlanta Falcons at 8:20 p.m. on Thursday. Who has the edge? What matchups should you watch? Who's hot, and who's not? Find it all here. The Eagles ran the ball very well early against the Falcons in their January playoff win, but struggled in the last 2 1/2 quarters. They gained 79 yards on their first 11 carries, but only 17 on their final 21 attempts. The Eagles will rotate their top three backs: Jay Ajayi, Darren Sproles and Corey Clement. The speedy Sproles, who missed most of last season with an ACL injury, gives the run game an element it lacked last season without him. Ajayi has been slowed by a foot injury, but will play Thursday. The Eagles had eight runs of 7 yards or more against the Falcons in the playoffs. Ajayi had five of them. The Eagles averaged 4.2 yards per carry in seven games before trading for Ajayi last October, and 4.6 with him, including the playoffs. The Eagles also will have nine-time Pro Bowl left tackle Jason Peters, who has recovered from ACL injury, back Thursday. The Falcons rely on quickness over size up front, and have speedy linebackers who can slip blocks and plug holes. With Carson Wentz still recovering from his knee injury from last December, Super Bowl MVP Nick Foles will start against the Falcons. Foles was unconscious in the playoffs, completing 72.6 percent of his passes and finishing with a 115.7 passer rating. He had a 158.1 third-down passer rating. Foles was 23 for 30 for 246 yards against the Falcons. The Eagles will be without their top wideout, Alshon Jeffery, who still is recovering from rotator cuff surgery. The Falcons have two excellent corners on the outside in Desmond Trufant and Robert Alford. With Jeffery out, the Eagles might go with more two-tight-end sets featuring Zach Ertz and rookie Dallas Goedert. Foles also will rely on his backs a lot in the pass game. Ertz was Foles' go-to guy in the playoffs. He had a team-high 18 catches, including 10 on third down. But the Falcons kept him in check, holding him to three catches for 32 yards. Zach Ertz had three catches against the Falcons in last season’s playoff meeting. The Eagles had the league's top run defense last season, holding opponents to 79.2 rushing yards per game. But they will be without suspended linebacker Nigel Bradham on Thursday — no small loss, particularly against the run, where Bradham excels. The Falcons gave the Eagles some problems on the ground in the playoffs, particularly on first down. The Eagles held opponents to 3.4 yards per carry on first down, fourth best in the league. But the Falcons averaged 4.4 yards per carry on first down and 4.3 overall against the Eagles in January. Tevin Coleman rushed for 61 yards on seven first-down carries. The Falcons rotate Coleman and Devonta Freeman. The pair combined for 1,493 rushing yards and 12 TDs last season. The 5-foot-8, 206-pound Freeman is more effective on the perimeter than between the tackles, while the 5-11, 206-pound Coleman is a one-cut runner whose strength is between the tackles. The offseason addition of Logan Paulsen, one of the league's better blocking TEs, also should help their ground game. After Matt Ryan had the best season of his career in 2016, his passing numbers tailed off significantly last season. His passer rating fell from an NFL-best 117.1 the year before to 91.4. His TDs-to-INTs differential plummeted from plus-31 to plus-8. He didn't throw more than two TD passes in a game the entire season. The Eagles held him to 5.8 yards per attempt in the playoffs. Julio Jones had a career-low three touchdown passes last season. He has 585 career receptions, yet has had more than two red-zone TD catches in a season just twice in seven years. Jones was targeted 16 times against the Eagles and finished with nine catches, but for only 101 yards, and failed to catch a potential game-winning touchdown pass in the end zone. The Falcons added another dangerous pass-catching weapon in the draft, taking WR Calvin Ridley in the first round. The Eagles have a solid, experienced pass rush and their deepest group of cornerbacks in several years. Falcons wide receiver Julio Jones (11) couldn’t hold onto this potential game-winning pass late in last season’s playoff meeting with the Eagles. Jake Elliott made 26 of 31 field goals in the regular season, then went 7 for 7 in the playoffs, including a 53-yarder against the Falcons. He was 14 for 16 from 45-plus yards. Ultra-dependable punter Donnie Jones retired and has been replaced by Cameron Johnston. Johnston has a big leg. He had 49.3-yard gross and 43.0-yard net averages in the preseason. It appears wide receiver Shelton Gibson will be the team's primary kickoff returner. He averaged 29.0 yards on six preseason returns. Darren Sproles, who missed most of last season after tearing his ACL, will once again handle punt returns. Even at 35, he is one of the most dangerous return men in the league. In four years with the Eagles, he has averaged an impressive 12.5 yards per return. Falcons place kicker Matt Bryant is 43, but still at the top of his game. He made 68 of 76 FGs the last two years. His 85.8 percent career field goal accuracy rate is the ninth best in league history. Zach Ertz had a big game against the Falcons last year. Eagles: QB Nick Foles. Forget his dreadful preseason. He had a 158.1 third-down passer rating in the playoffs and was the Super Bowl MVP. Falcons: C Alex Mack. The five-time Pro Bowler might be the best run-blocking center in the game. He allowed just two sacks, one hit and 12 hurries last season. Eagles: DE Derek Barnett. He had five sacks as a rookie, but seemed to hit a wall late in the season. He had just seven pressures — one sack, one hit and five hurries — in the last six games, including the postseason. Falcons: WR Julio Jones. Jones had a career-low three touchdown catches last season and let what would have been a game-winning touchdown catch slip through his fingers in the Falcons' playoff loss to the Eagles.